Edmond Hoyle, in the early 18th century, compiled the basic rules of play for card games into one book. 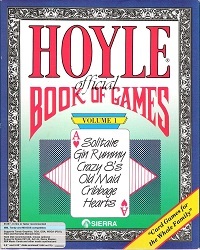 Now Sierra brings you six games to play "according to Hoyle", which still means "by the book": Cribbage, Crazy 8's, Gin Rummy, Hearts, Klondike Solitaire and Old Maid. It's an excellent way to learn the official Hoyle's rules of play, to perfect your strategies, or simply to enjoy playing great games against a worthy opponent. From the very experienced, wily card buff in the game room to the three-year-old moppet in the nursery, there is something for everyone in these games. The experienced card player will enjoy an exhilarating and stimulating game of wits. The inexperienced card player will be able to learn the game, using all the correct rules of play, and can develop expertise to use when playing conventional cards with others. Even a three-year-old can play "Old Maid" alone after a little guidance. There are a total of 18 opponents with different skills to play against. Play against ruthless card sharks - The Kid, Lenny, Colonel Dijon and even the author of the program. 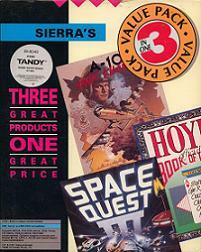 Or play against Sierra's super heroes and heroines. You've been through a lot with them - saved the galaxy with Roger Wilco, completed critical quests with King Graham and Rosella, been in several wrong places with Leisure Suit Larry, tackled the underworld with Sonny Bonds. Now you can sit down and enjoy a friendly game of cards with them. Designed by Warren Schwader, who also made Hi-Res Cribbage for the Apple II in 1980, this was the first in a series of Hoyle games by Sierra, lasting for nearly fifteen years. Warren Schwader also worked on two more installments, Hoyle volume 2: Solitaire and Hoyle Classic Card Games, a VGA remake with two additional games with Sierra's SCI engine. 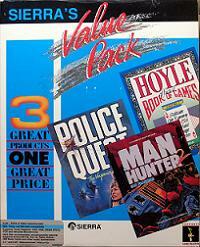 It was released for the Amiga, Atari ST, IBM PC and Macintosh.